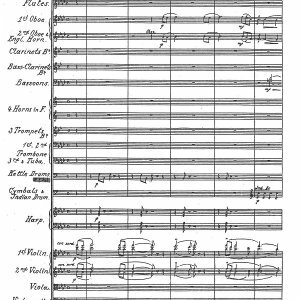 This holograph manuscript source,1 which is held at the Library of Congress in Washington, DC along with the full score manuscript of the F-major Symphony,2 suggests that an orchestral version of a D-minor symphony may have existed. There is some evidence that the four-hands version of the piece was the original, however, and that d’Albert intended to orchestrate it later. The first movement is an Allegro vivace with an inscribed completion date of Friday, December 27, 1878. The Poco Adagio second movement was completed on February 21, 1879. The third, intended to be a scherzo marked Presto, has a false start in C minor; d’Albert then restarted the movement in B-flat (following an attacca G-minor chord), before trailing off with no conclusion. Dedicated to one of his formative teachers, Max Pauer, this unknown work demonstrates the teenaged d’Albert’s early interest in composing for the orchestra, in theory if not yet in practice. In a sense d’Albert’s career trajectory followed that of another of his mentors, Franz Liszt: best known at first as a virtuoso pianist, he later developed a focus on his compositional work; in d’Albert’s case the calling was opera, but he also composed a number of piano works, concerti, and Lieder in addition to his operatic contributions, especially in the early stages of his compositional career. D’Albert referenced in a letter to his parents on March 15, 1882 that he had shown some of his symphony to Brahms,3 who had taken an interest in the precocious musician. It is usually assumed that d’Albert showed Brahms excerpts from the F-major Symphony, but the date of the correspondence suggests that it may have been an earlier work shown to Brahms—perhaps even a portion of the D-minor symphony mentioned above. On the final page of the manuscript is a brief sketch for an unrelated “Klavierstuck 4.” The orchestral manuscript’s title page does not indicate a dedication, but in the published score the symphony was dedicated to the pianist and composer Karl Klindworth (1830-1916; Klindworth was noted for his piano reductions of the Ring cycle, among other compositional and pedagogical accomplishments). The four-hand version offered by Ed. Bote & G. Bock was not arranged by d’Albert, who of course was perfectly capable of such a task. Instead, it was prepared by Robert Keller (1828-1891), an arranger best known for his piano adaptations of the music of Brahms, giving some indication of the expectations of success for the work. By the time d’Albert completed his symphony at the age of 21, he had composed many works that remained unpublished. But preceding works that he had seen through publication included his opus 1 suite for piano, the B-minor opus 2 piano concerto, and a set of ten Lieder as his opus 3. While the piano concerto drew on Lisztian sonorities and structure, d’Albert’s symphonic debut owed more to the music of Brahms. 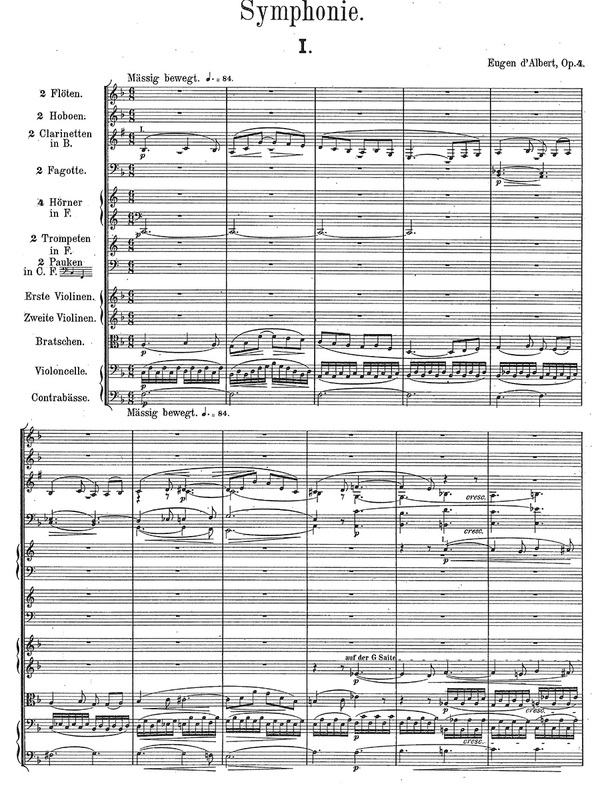 While d’Albert’s symphony was accepted for publication in 1886, the composer would not have the opportunity to really experience the piece until working with Hans von Bülow and the Berlin Philharmonic in January of 1892, when they prepared the work for performances in Berlin and Hamburg.4 D’Albert apparently took Bülow’s suggestions to heart, editing the work under Bülow’s constructive critique, and Bülow in turn also grew from the experience.5 While the work would not become part of the “canon,” it nonetheless represented an important step in d’Albert’s development as a composer. His efforts in the symphonic realm served d’Albert well as he continued writing instrumental music, and by the time he moved into the world of opera he was able to write adeptly for the orchestra.